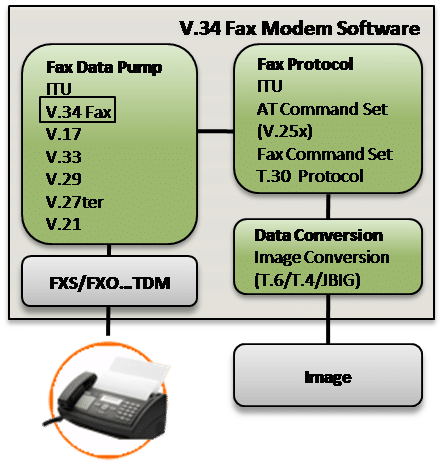 V.34 fax software supports high speed facsimile transfers up to 33,600 bps on switched telephone networks and on point-to-point 2-wire leased telephone-type circuits. Our V.34 fax software provides a real-time implementation with full support for multichannel applications. Contact us to discuss your V.34 fax application requirements. VOCAL’s V.34 fax software is optimized for DSPs and conventional processors from TI, ADI, Intel, ARM and other leading vendors. The software libraries are modular and can be executed as a single task under a variety of operating systems or standalone with its own microkernel. V.34 fax software may be licensed standalone, with a library or a complete design with custom solutions available. ITU-T V.34 defines the modulation methods and operating sequences for a high speed fax modem used on General Switched Telephone Networks (GSTNs) and on point-to-point 2-wire leased telephone-type circuits. V.34 fax uses state-of-the-art line probing analysis to automatically determine maximum channel capacity. It also supports MSE fallback/fallforward threshold control to adjust the tradeoff between higher data channel rates and symbol error rates. V.34 channel separation is accomplished using echo cancellation techniques. V.34 fax uses Quadrature Amplitude Modulation (QAM) with synchronous line transmission to support selectable mandatory rates of 2400, 3000, and 3200 symbols/s and optional rates of 2743, 2800 and 3429 symbols/s. Asymmetric symbol and data rates are also supported. Negotiation and training sequences at startup establish the data rate. V.34 modem control channel rates are 1200 and 2400 bps, with an optional auxiliary channel with a synchronous data signalling rate of 200 bit/s. Trellis coding for all signaling rates and shell mapping permit satisfactory performance even over noisy channels. Adaptive techniques are used to achieve close to the maximum data signaling rate that a V.34 channel can support on each connection. Using the Command Set Controller (CSC) in VOCAL’s T.30 library or with VOCAL’s facsimile service Class 1 Command Set(EIA-578 and T.31), application software developers can control all of the V.34 fax modulations and data streams . The T.30 library could in turn be controlled by VOCAL’s facsimile service Class 2 Command Sets T.32 (Class 2.1), EIA-592 (Class 2.0), or industry standard (Class 2). With Class 1, most of the protocol is executed in software, with the advantage that any changes don’t require hardware modifications. This is in contrast to Class 2, where image processing is handled by the modem. The line interface for the V.34 fax may be an analog front end (codec and DAA) or a digital interface such as T1/E1, Switched 56, and ISDN. The upper end of this software offers a direct binary and HDLC interface. Facsimile service class 2 command sets (T.32, EIA-592 and industry standard class 2) available. Use with VOCAL’s Command Set Controller (CSC) and T.30 library. System can be combined with other Group 3 fax modulations (V.17/V.29/V.27ter/V.21 channel 2). VOCAL’s optimized fax software is available for the following platforms. Please contact us for specific V.34 fax supported platforms.